A delicious, organic and fairtrade very high cacao content chocolate. Noir Absolu is the chocolate for those who wish to appreciate the full rich and deep taste of the best quality cocoa. This chocolate contains 85% organic cocoa and 15% organic cane sugar, but no emulsifier. It is conched for a very long time to give the best possible taste. The company was founded in 1998 by Tristan Lecomte, a leading figure in the world of fairtrade. Now, Alter Eco supports 40 cooperatives in 25 countries. 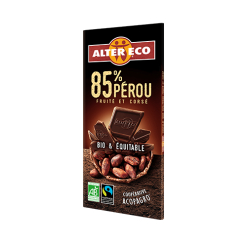 It is a leading fairtrade brand in France, utilising pa”ships with local farmers, and distributing organic and fairtrade products in several European countries, North America, Australia and Japan.